With a monopod designed for the GoPro, you can easily record yourself while enjoying your outdoor activities. Monopods are available in a variety of designs – with features that can help make self-recording a little easier. Here are the top 10 best monopods for the GoPro in 2019. Find the ultimate selfie stick for your GoPro camera. The first monopod in this list has a unique design. Instead of a telescoping pole, you get a monopod that unfolds. There are 3 arms to the pole, along with a foldable extension arm. This allows you to adjust the length of the monopod from 5.9-inches to 19.3-inches. The folding design is interesting. It does give you more options for positioning the camera but also limits the total length of the pole. For example, you could adjust the pole to reach around corners, over the top of a ledge, or simply extend the arms so that they are flat. Overall, this is a convenient monopod, but it does have a few issues. The short length and the fact that it’s not waterproof could be a problem, depending on how you plan on using your monopod. 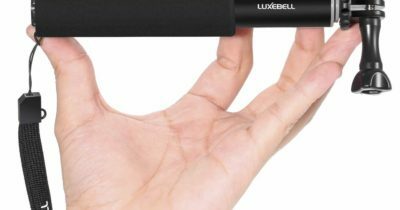 The next best monopod is this short 19-inch waterproof hand grip. It is an adjustable extension stick for small cameras, including the GoPro cameras. 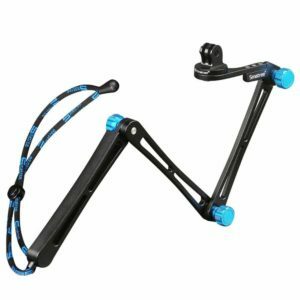 It extends from 7.25-inches to 19-inches, which may be short compared to other options, but also helps this stick work as a stabilizer for your camera. There is one drawback that you need to be aware of. The bottom of the stick doesn’t have a nut for connecting a tripod. The other sticks have this located on the bottom so that you can easily mount the monopod on top of a tripod to give the tripod more height. Other than this problem, this is a decent monopod. It gives greater control so that you can get great shots while on the go. Here is an incredibly long pole. With this monopod, you can extend your stick to 67-inches. That is over 5-feet in length, so that you can get a greater view of the surrounding area. At that height, you can take impressive shots from above your head. When you collapse the monopod into its original size, it is still rather large. You may have trouble fitting in smaller bags. Also, the dye that is used on the foam can start to rub off on your hands. This isn’t always the case and depends on how sweaty your hands get. If you find this to be a problem, you could wrap the grip with hockey stick tape. The next choice is a waterproof monopod for the GoPro. It features a universal mount that should be compatible with most cameras. You shouldn’t have any issues connecting your GoPro. It has 3 sections, allowing you to extend the pole from 14 to 35-inches. The bottom line is that this is a quality monopod, especially if you’re looking for a waterproof option. You can take it scuba diving or swimming, without having to deal with rust. This is another monopod that is not waterproof. While you could still take it in the water, you’ll want to make sure that it is thoroughly dry before you use it again. The other issue is that this doesn’t have a quick release. Again, not a big deal, but there are selfie sticks with a quick release to make it easy to remove the camera. The wrist strap is connected to a ring that is attached to the monopod. This ring can become loose, which would make the wrist strap a useless feature. As mentioned, this pole is not waterproof. If you intend on taking your selfie stick in the water, then you’ll need to use extra care. This means taking the pole apart and allowing the individual components to dry before putting it back together. Otherwise, it may rust. That’s the biggest issue with this pole. Other than that, it’s a great choice. It extends to 36-inches and is built with quality materials. Those disadvantages may not deter you from buying this monopod. This is a top choice due to the durability of the pole and the included accessories. You get the pole, a wrench, and an aluminum thumbscrew. The end of the pole has a removable blue rope that can be wrapped around your wrist for added security while using the pole. It’s not the most lightweight selfie stick, but it is durable. If you want a sturdy extendable stick that can be used in nearly any setting, this is a great choice. The drawbacks are minor and the features are useful. This is a convenient monopod for the GoPro cameras and there aren’t any disadvantages that need to be addressed. The only potential issue is the length of the pole. It can extend to 18.1-inches, which is about half the length of the next option. The top choice for GoPro monopods is this telescoping stick. It features a flexible ball head that provides 360-degree rotation. Easily get the best shooting positions with this extendable monopod or convert it into a tripod with the provided tripod stand. There are no disadvantages, as this is the top option. When the stick is contracted, it is compact and easy to store. It’s also incredibly versatile. You can extend it 3 feet or attach the tripod pod. 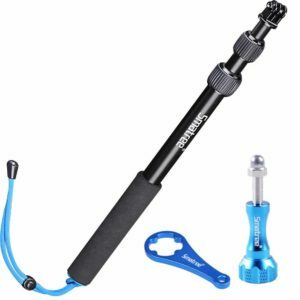 Overall, this is the best monopod for the GoPro series of cameras – it also works with most compact cameras and cell phones. When shopping for a monopod for your GoPro, you should consider the length of the stick and other features that are important to you. This selection of the top 10 best monopods for GoPro in 2019 covers a variety of styles that should suit any of your needs. Before you make your final decision, you should double check the features – including the size of the monopod. This is a universal and multipurpose handheld monopod device for GoPro Hero 1, 2, 3 as well as 4. This professional monopod can also be used for Galaxy S5 or S6, as well as for other smart phones – the best thing about it is that it can easily be rotated 180-degrees in order to control the shooting angle. The handle of this monopod is made from high-quality, non-slip soft foam! 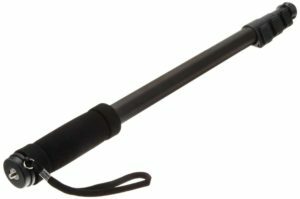 This is a handheld monopod that is entirely made from lightweight and durable aluminum of the highest quality – this is what makes the monopod light yet strong enough to last for a lifetime! The monopod for GoPro Hero4 also comes with quick and effortless length adjustments, and it is specifically designed to offer the best shooting effect you can get. This is one of the most advanced monopods for GoPro Hero4 available on the market – made and sold by Floureon, this extendable handheld monopot can easily increase the distance between you and your camera, so you can get the best shooting effect possible. Moreover, you can easily rotate your GoPro as you wish, and on top of that it is fully compatible with most digital cameras as well! 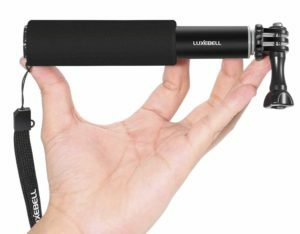 This is more than just an average monopod or extender – it also doubles as an efficient selfie stick designed to keep your camera or your smart phone steady, thanks to the screw staple that controls the head ball of the monopod. Moreover, this monopod for GoPro Hero4 also comes with two attachment straps, and it is made from an advanced aluminium alloy. 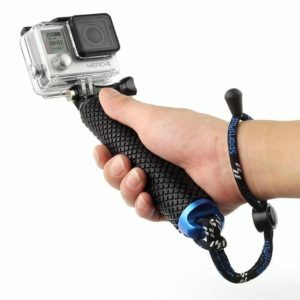 This monopod for the GoPro Hero 4 is certainly one of a kind – and it is versatile enough to be used for just about any GoPro camera. Featuring an advanced dual buckle mount head that allows users to lock in two cameras at once, this monopod only weighs four ounces and it is very durable in the long run. Made and sold by Kansang, this Monopod is suitable for all the GoPro camera models, and it can also be used for your iPhone, Blackberry, Samsung and your digital camera. 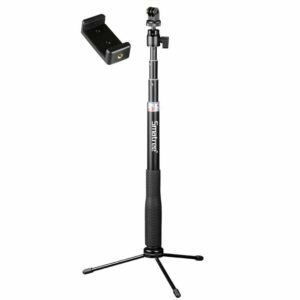 This is a telescopic monopod pole sold by Shineda, and it features an advanced twisting lock system designed to stop any and all vibrations that may occur when you are trying to shoot a video or to take a picture. Moreover, the ball head of this monopod pole is made entirely from aluminium and it rolls 360-degrees. The handle is made from high density foam that ensures a great grip, too! 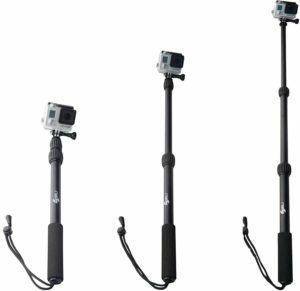 This is another versatile and fairly easy to use handheld monopod that can be used for every GoPro Hero model – 1, 2, 3 and 5. There is also a remote control that you can use if you plan on coupling this handheld monopod with your smart phone. 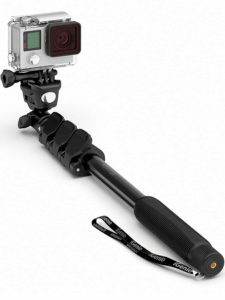 This telescopic pole and handheld monopod for GoPro Hero 4 is great both for amateurs and for professional photographers who want to make the most of their cameras. Made with durable, lightweight and reliable materials, this monopod also features a removable cradle for effortless wifi remote attachment, and it also comes with a safe and efficient clip lock extension! This is basically an all in one selfie stick that can be used not just for the GoPro Hero series, but for most smart phones and compact cameras as well. 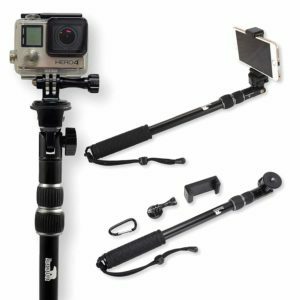 The number one on the list is undoubtedly this extendable handheld monopod by Enko, which can be used for all types of GoPro Hero cameras. This is actually a professional sports monopod that features an advanced anti-slip handle and a very lightweight and waterproof ergonomic design. It comes with a 24-month money back guarantee as well! To conclude, these are the most appreciated and most commonly bought monopods for GoPro Hero 4 cameras in 2017!